Sandra Blake Captures 3 World Records for Landlocked Striped Bass! On May 26, 2016, Sandra caught this fish (8 lbs. on 30 lb. test line) on Lewis Smith Lake in Crane Hill, Cullman County, Alabama with Captain Bill Vines. Smith Lake is a man-made impoundment with trees, houses and other objects still intact after the flooding. The fish was hooked at about a depth of 40 feet and went down into the pine trees, but she managed to pull it up and out anyway! Sandra also captured the IWFA Club Record for Landlocked Striped Bass with a 20 lb. fish caught on 8 lb. test line. Congratulations, Sandra! 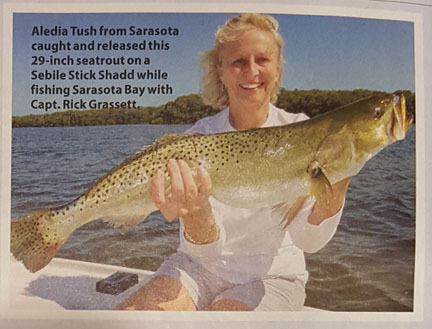 On July 30, 2016, Merrily Simmons, Jill Gaddis, Melissa Littlewood, Becki DeRosa, and Judy Axelrod gathered to fish and celebrate Aledia Tush's winning the 86th Sarasota Tarpon Tournament for the third time! 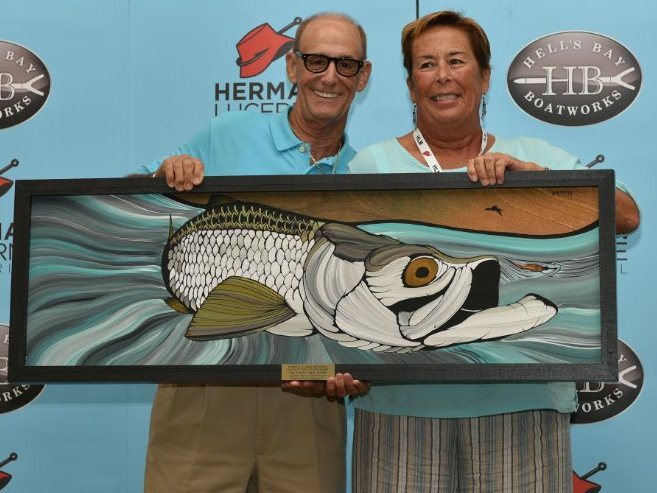 This tournament, held in Sarasota, Florida, is the oldest Tarpon tournament in the world. We are very proud of Aledia and wish her continued success next year when she could become the only person ever to win This tournament four times! We will be there again to cheer on. Aledia Tush won her third Sarasota Tarpon Tournament victory, making her the first female angler to accomplish this feat. Her 28.5" catch was enough for the win. Each year the University of Miami Sports Hall of Fame hosts a tournament in June to benefit Habitat for Humanity. This year 4 IWFA ladies, Brooke Black, Connie O'Day, Kathy Gillen and Linda Denkert fished the tournament. Kathy and Connie fished together with Capt. Dave Denkert and Kathy took home the Longest Redfish and Longest Seatrout Awards. Linda Denkert missed the Longest Snook award by 0.5". The winner of that award was a 9 year old child, so she was happy to have been defeated by a child. Linda and Brooke fished together with young M.E., Brooke's daughter and Capt. Richard Black. HLM Backcountry Tournament in Islamorada in September.